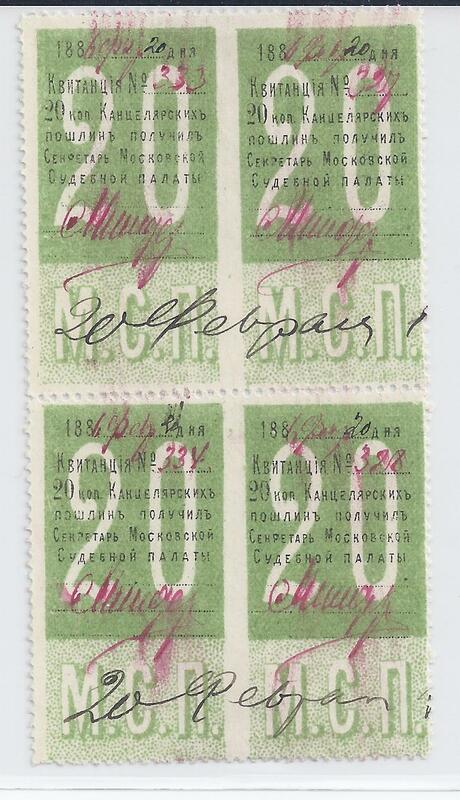 St Petersburg and Moscow police departments began using adhesive stamps to record payment of residence permit fees in the 1860s. 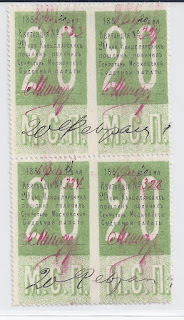 Most St Petersburg stamps are common, though one is a great rarity, but Moscow’s are not common even though they remained in use until at least 1881 when new stamps prepared by the State Printing Works were issued. Nothing about the first Moscow issue suggests it was printed by those State works. 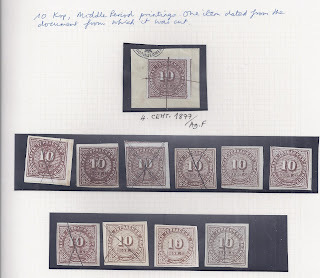 The gum, the variable paper, the wide variation in colour, the deterioration of the printing plate, the lack of alignment of individual stamp clichés – all this is well below the standard achieved by the State works. 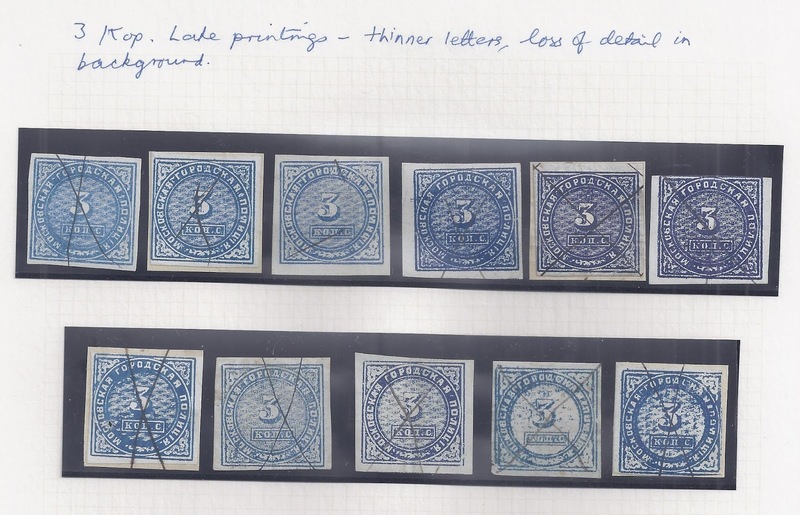 The stamps look like a job which might have been done in-house by the Police department itself. 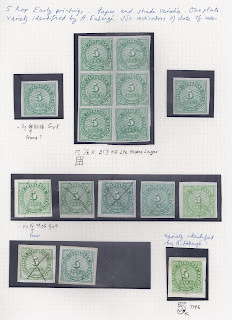 To me, the stamps look as if printed by lithography, the plates retained over a long period and the quality of the print greatly deteriorating. It is quite difficult to study the issue for four reasons. First, the scarcity of large mint multiples for plating purposes. 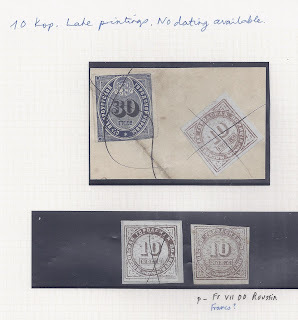 Second, the impossibility of dating the use of stamps which have been taken off document, where they were always cancelled by a simple pen cross. 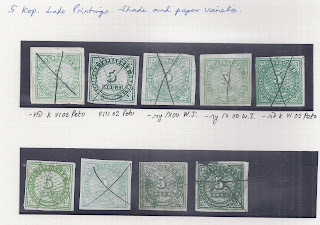 Third, and connectedly, the difficulty in distinguishing printings when there appears to be wide variation within printings and not just between them. 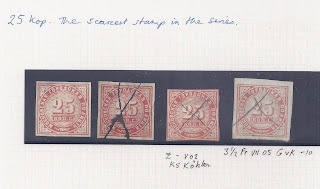 Fourth, the scarcity of stamps used even on a fragment of a document. In addition, lacking access to the relevant sources I do not know what the fee structure was or how it changed. 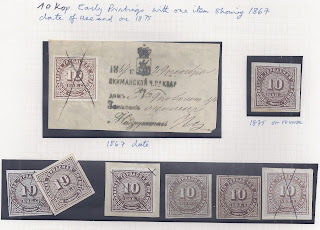 On the pages illustrated below I have assembled over 100 Moscow stamps now in my possession. About half of them have pencil notes on the reverse which indicate that they are from Agathon Faberge’s collection. 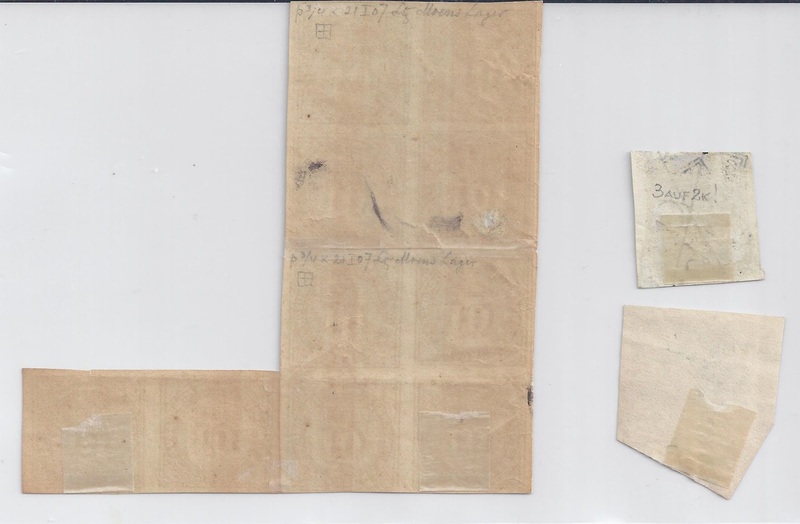 These notes are dated between 1900 and 1907, though some notes do not give a date. 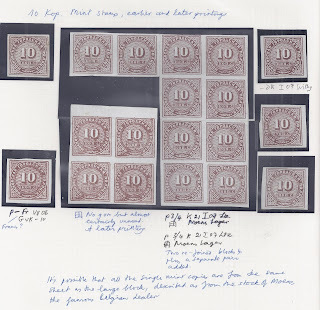 It is my belief that Faberge annotated stamps that he bought individually but that, in addition, he bought bundleware or kiloware of these stamps for research purposes and only annotated those where he noticed something unusual. 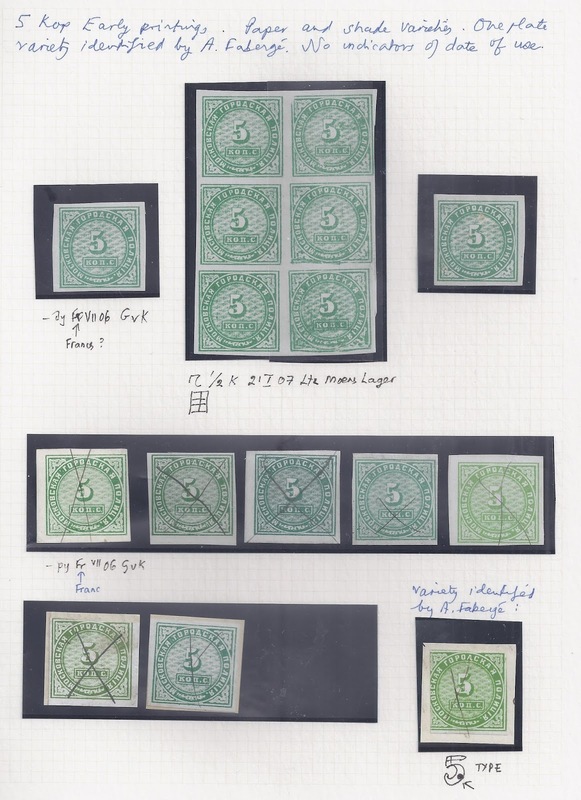 My guess is that in the 1900 – 1914 period Faberge owned and studied many hundreds of these stamps, now dispersed across many collections. My assembly does not include two varieties listed in the John Barefoot catalogue: an error of colour on the 5 kopeck printed in blue instead of the correct green; and a perforated version of the 5 kopeck green. I have never seen either and would be pleased to illustrate them here if anyone has either of them. 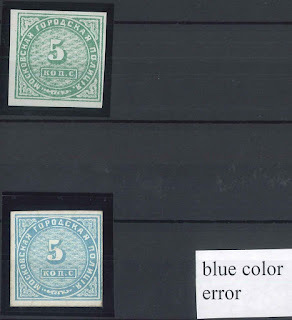 Added: John McMahon has kindly provided the following scan of his error of colour stamp. This appears to be the only recorded copy,from the Marcovitch collection. 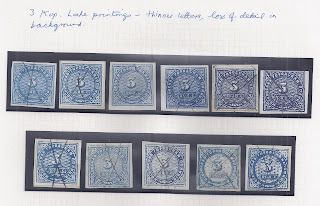 However, to my eye, the blue would be more convincing if it could be matched to the same blue appearing on a 3 kop stamp (the 3 kop stamps were printed in blue). 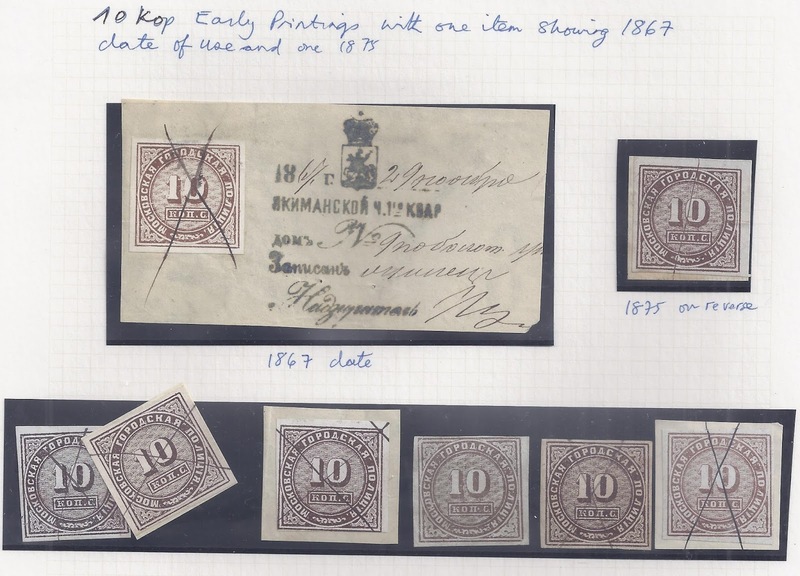 I can show two varieties identified by A Faberge: bisects on the 2 kopek and manuscript revaluation of a 2 kopek stamp to 3 kopeks. 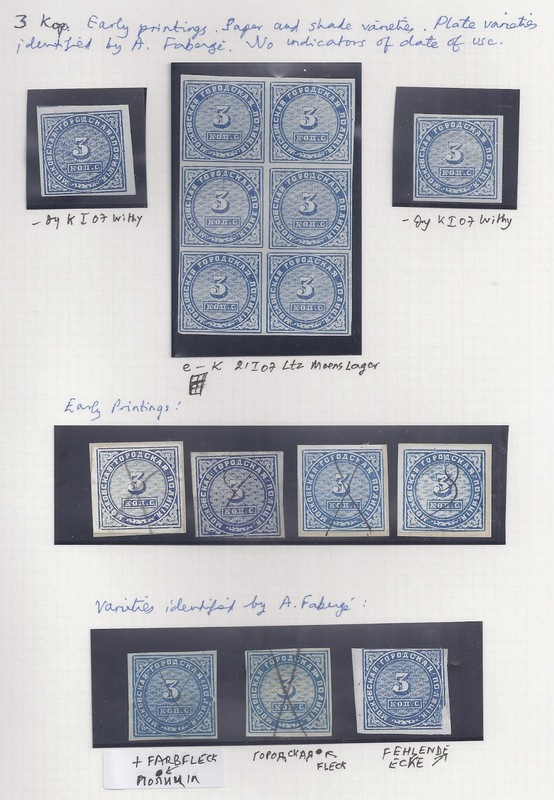 On my very provisional pages, I have copied back-of-stamp A Faberge’s notes and written them underneath the stamps on which they are found. Any notes above the stamps are mine. 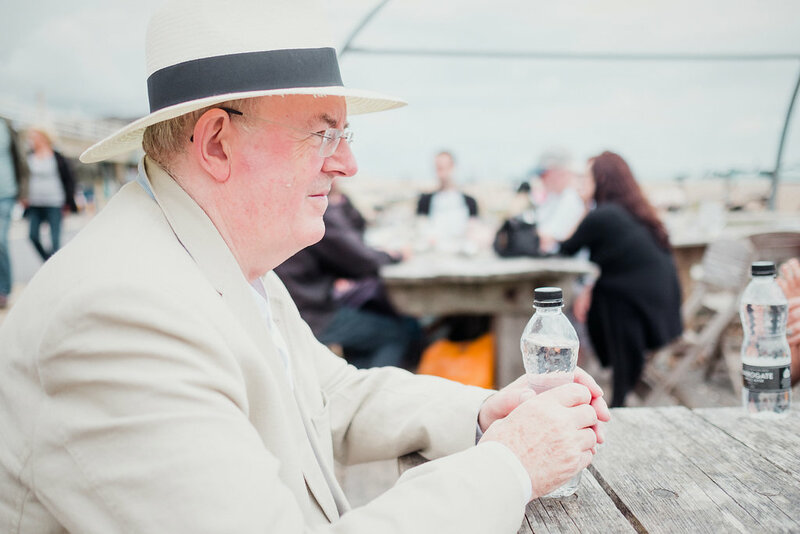 Click on Images to Magnify. This Blog post assumes you have read the previous Blog post. I have seen the stamps of Yaroslavl before but not on complete document. This one, dated 1878, and folded for the illustration was obtained by Agathon Faberge in September 1913. He got it from Göschiel [ not a supplier I have encountered before ] and paid 15 rubles [ pd – k – 20 IX 13 Göschiel: I decode the “k” as “ kauft” meaning purchased rather than “k” as in kopeck. See Hellman and Stone, Agathon Fabergé, page 242 ]. It seems that B E Saarinen picked out some of these provincial fiscals for re-mounting and I assume that the simple exhibit page below is his work (further information welcome). 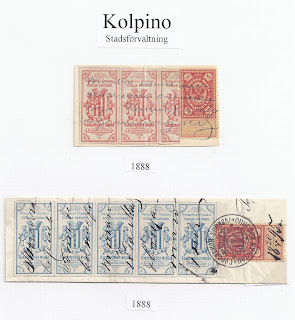 I haven’t seen the two listed stamps of Kolpino before. 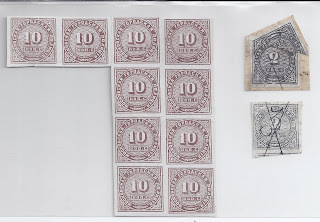 Agathon F got the top piece with the red stamps from Karing in 1914 but no price is indicated. Agathon has also worked out the date written across the stamps as 15 September 1898. 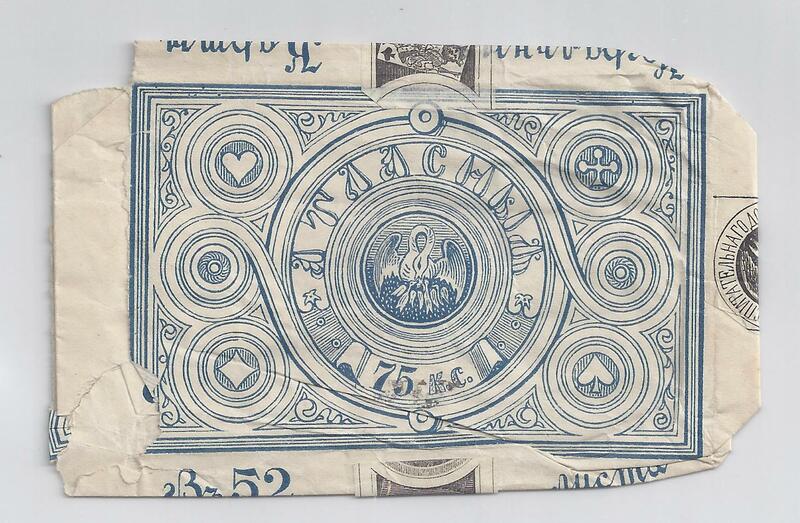 There are no notes on the back of the strip of blue stamps but I suspect they are also ex-Faberge. 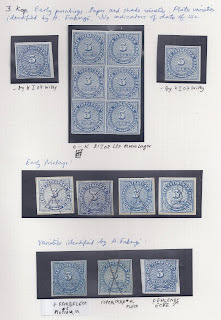 Faberge was able to acquire some court fee stamps in bulk, notably from Baku, where someone cut off many hundreds of the locally-produced stamps from their original documents. They ended up in Faberge’s hands and were eventually dispersed. The Faberges did begin to study them, though the published plating study is due to Jack Moyes. 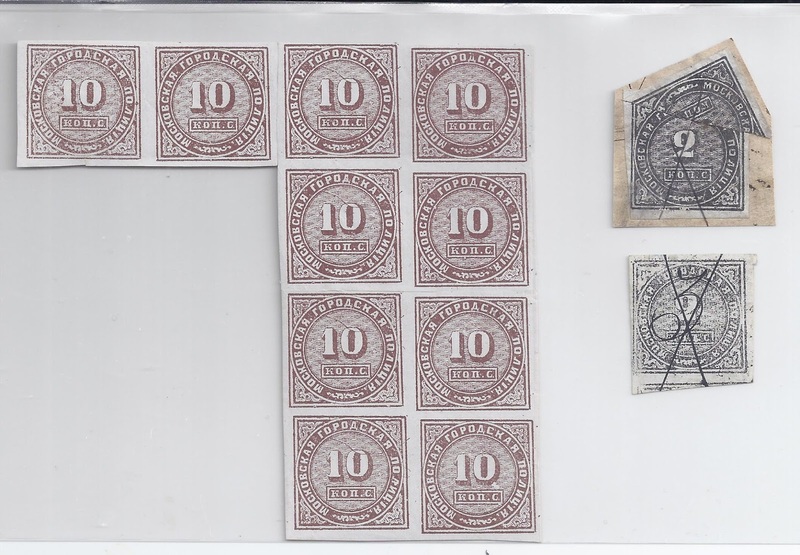 The stamps were printed like raffle tickets in strips of six. 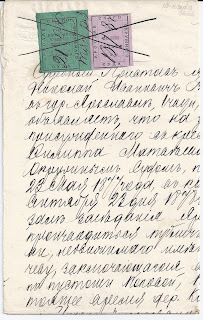 The counterpart to the left of the MAPKA part was a receipt KVITANTSIA. These are rare. There is one example in my new acquistions, and on the back Oleg F has written FOTO, suggesting that an article or book was contemplated on the lines of the Zemstvo book for which Oleg also wrote FOTO on the back of items. 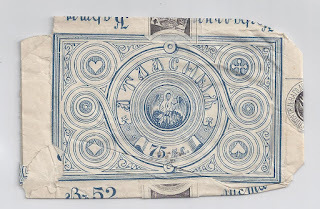 More difficult than any provincial revenue stamps are the tax banderoles and labels applied by the Maria Feodorovna charities to packs of playing cards, over the production of which they held a monopoly. People who played cards were wasters rather than hoarders and simply did not think to keep the bands and labels for future collectors. So it was an agreeable surprise to find in my London purchase a complete but empty playing card packet. Faberge is the collection which keeps on giving. Agathon and Oleg never organised it all or disposed of it all in a systematic fashion and undocumented material still keeps appearing, as it did on 21 September in a London auction which offered 27 lots of mainly Faberge Imperial Russian fiscal material. 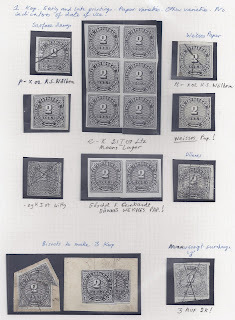 In the same period of fifteen years before World War One when Agathon was assembling his Zemstvo collection, he was also assembling a Russian Imperial fiscal collection in very much the same way. 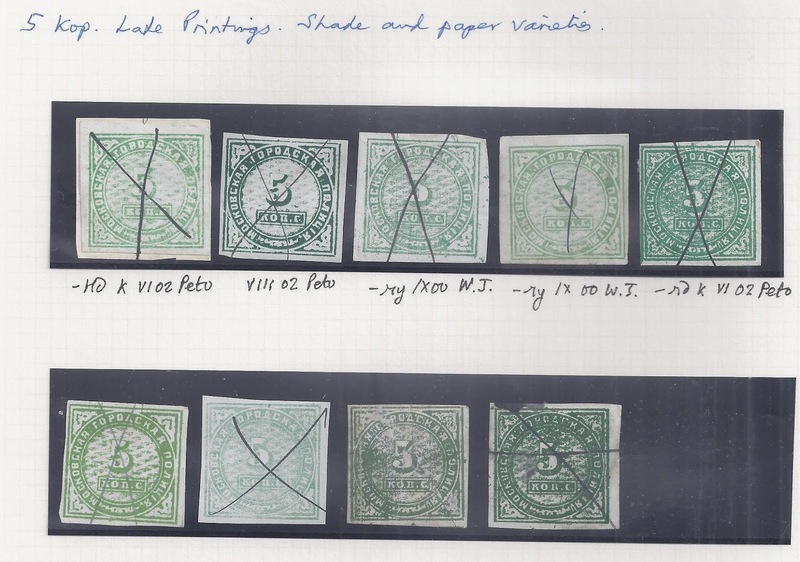 He bought common stamps in big quantities and then tried to plate them or looked for errors and varieties (and found them). He made notes on the backs of stamps recording his discoveries, though in the case of common stamps I do not think he always wrote the name of his supplier and the price paid. 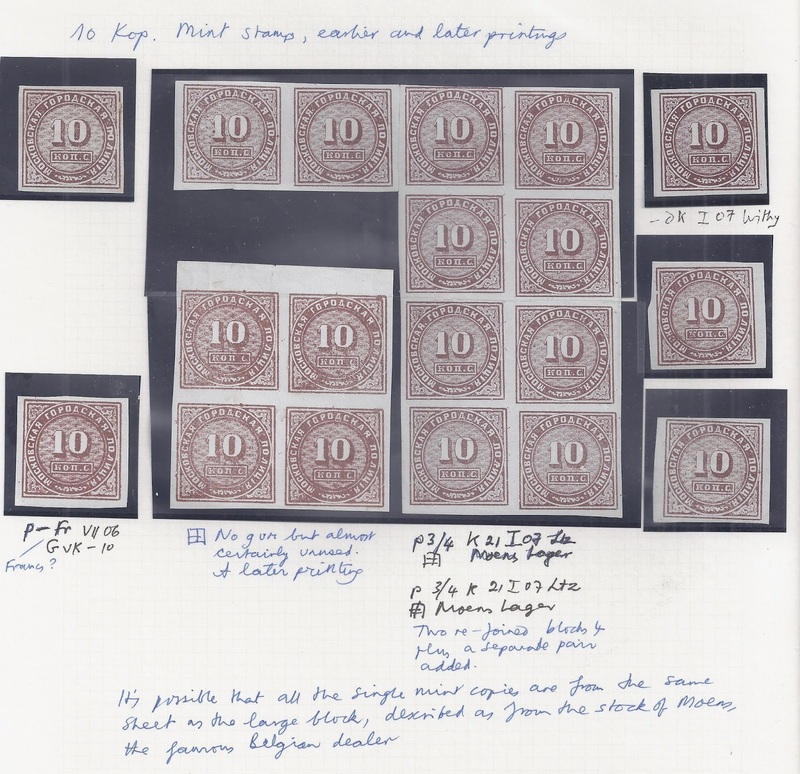 He bought scarce stamps and also fiscal documents and stamped paper, though some categories of document were hard to obtain. Only when things like court archives were later disposed of or simply looted did complete documents become available. When Agathon got to Finland in 1927 there were probably some emigres happy to sell him old documents from their family archives. I think Agathon mounted some of his collection on album pages and I think that Oleg re-mounted them, as he did the Zemstvos. Oleg also put on to album pages stamps which had never been there before. This much I infer from the hinges on the backs of a great deal of ex-Faberge material. But at some point all the material was taken off pages. In contrast, when after Oleg’s death, Corinphila sold the Faberge Zemstvo collection in 1999, about ninety percent of it was on modern, massively annotated album pages which represented many meters of shelf space. 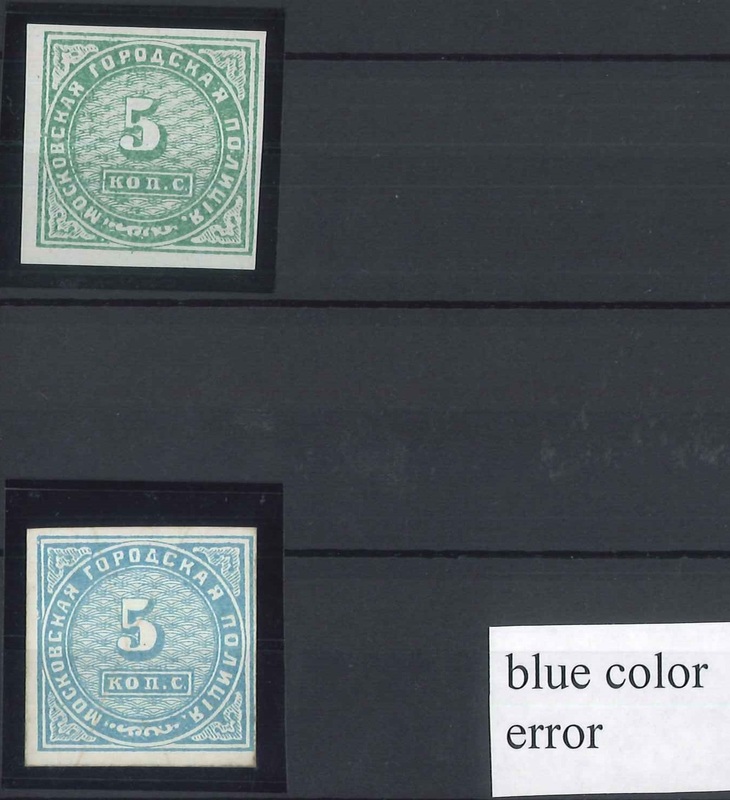 As an example of a research item, consider the scan of this Moscow Police stamp. 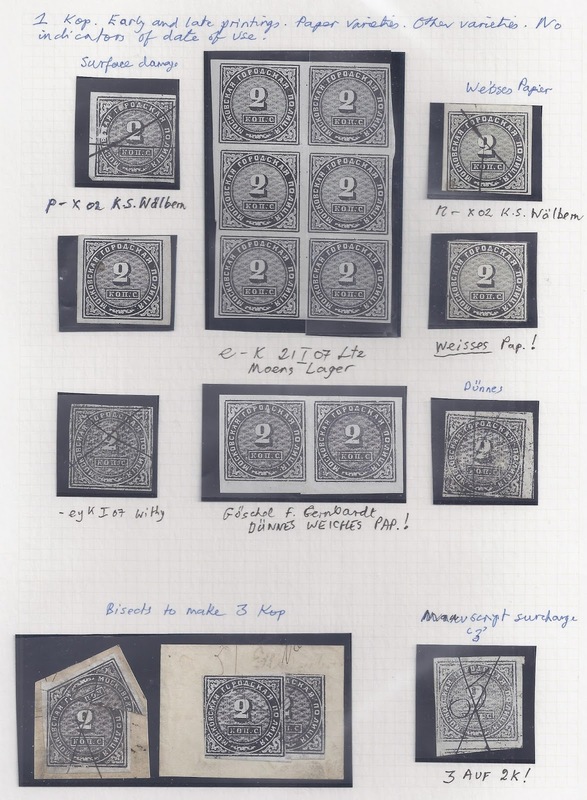 On the 21 January 1907, Agathon bought two blocks of four from Lentz [abbreviated as often the case to Ltz] who in turn had got them from the stock of the Belgian dealer Moens [ Moens Lager, in pencilled German]. Separately, a pair has been acquired and either Agathon or Oleg has then re-joined what are parts of a separated block, using slips of stamp hinge. This gives an unusually large mint multiple for this early stamp. But though the block has two modern hinges (presumably Oleg’s), we now have no indication of how it was written up. 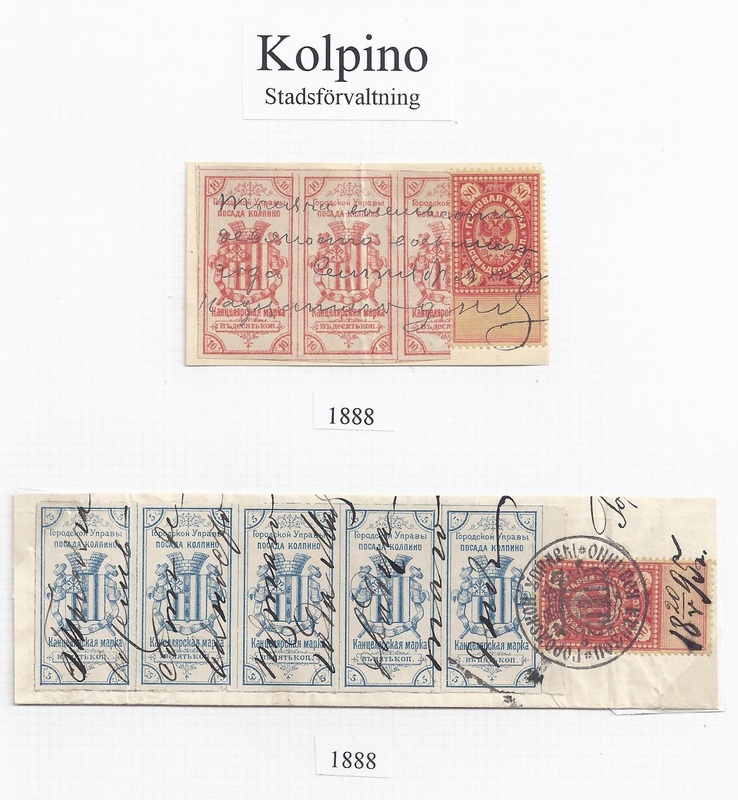 Agathon’s and Oleg’s close attention to the detail of common stamps did pay off. The stockbook contains, for example, a bisected 2 kop stamp used to make up a 3 kop rate. That is not unusual. But it also contains a 2 kop stamp uprated in black ink to make a 3 kop rate, a fact I only discovered when I turned over the stamp and read on the back 3 auf 2k! I would be interested to know if this variety has been recorded elsewhere. I show it above along with an example of the bisect.